We appreciate your patience as we develop our website. There are many more items available than are shown on this page. The book "Sketches of Village to Town to City - Recalling Aberdeen, Maryland" by Charlotte Cronin is available at the museum as your gift with a $20.00 donation to the Aberdeen Room. 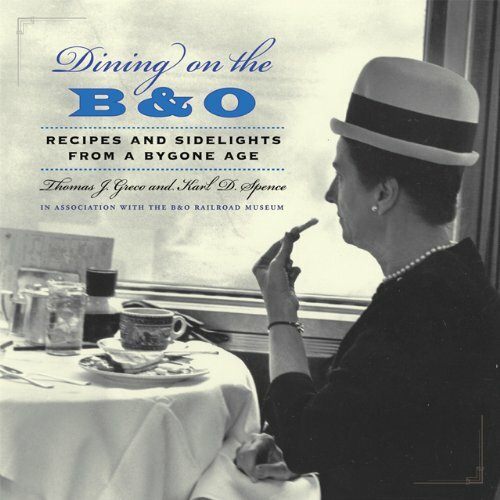 The book "Dining on the B&O: Recipes and Sidelights from a Bygone Age" is available at the museum as your gift with a $40.00 donation to the Aberdeen Room. Thomas J. Greco and Karl D. Spence combine many of the B&O's best recipes with historical photos to capture the elegance and charm of the dining car experience. Our gift shop offers an assortment of attractive notepaper & post cards available with pen and ink drawings of Aberdeen's past and present hand drawn by curator Charlotte Cronin. Here are a few examples of these special creations.